Posted: November 11, 2017 1:30 p.m. This year’s celebration of International Education Week, November 14 – 17, focusses on the amazing array of opportunities available to students wanting to study in Europe. 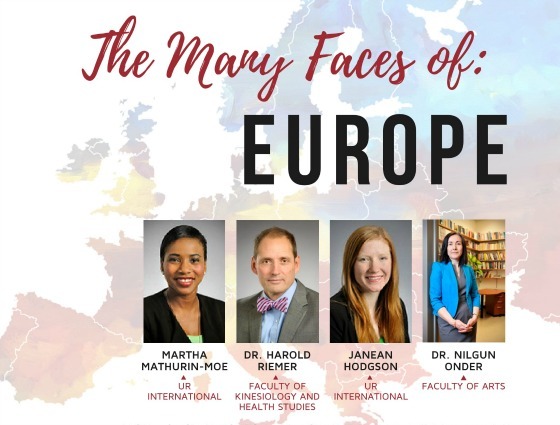 The Many Faces of Europe is the theme of the International Education Week. Students, faculty and staff are encouraged to take part and learn about the options available at dozens of partner institutions in Europe. The week begins November 14 with an opening ceremony at noon at the Multipurpose Room of the Riddell Centre that will feature a Greek-inspired lunch. Tickets are $15 each and can be purchased at the door. Students, faculty and staff are encouraged to attend. In partnerships with The Owl, there will be a pizza night on Thursday, November 16th. Tickets can be purchased at door for $8 each. All other events during the week are free. The week of activities includes sessions on building relationships with an international partner institution presented Dr. Harold Reimer, Dean of the Faculty of Kinesiology and Health Studies; A session for students on how to apply to a student exchange and a personal perspective on internationalization with Dr. Nilgun Onder, Associate Dean in the Faculty of Arts. Faculty and staff are invited to a session November 14 on mobility opportunities in Europe. The University of Regina has agreements with most countries in Europe offering programs and classes for undergraduate and post graduate students. In the United Kingdom alone, there are opportunities in at least 17 institutions. The week concludes with a workshop on learning traditional Ukrainian dances November 17, 3:00 pm – 4:30 pm at the Global Learning Centre, College West (CW115). Registration is encouraged. Please visit here for more details.